Robocop is not exactly famous for being a chaste, family friendly viewing experience. Paul Verhoeven’s classic 1987 actioner is one of the bloodier action films to ever squeak into theaters with an R-rating, and it was by no means an easy rating to obtain. In order to secure an “R,” Verhoeven had to shorten or otherwise censor many of the film’s most shockingly violent moments, submitting the film 11 times to the MPAA before they reduced its rating from the “X” it kept receiving. It was a notable precedent for exactly how much film violence you can get away with in an “R” rating, as Robocop is otherwise fairly light on overt sexuality. 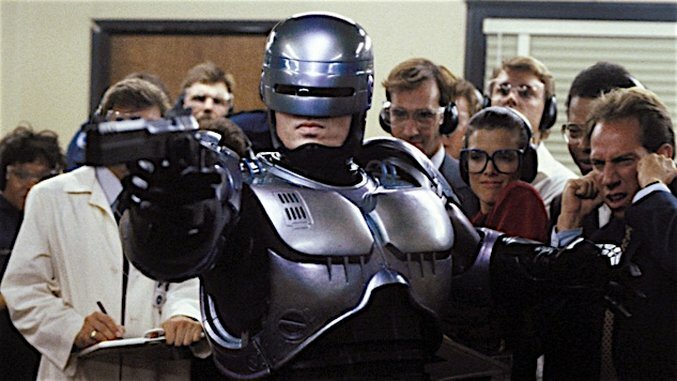 Still, all those cuts made by Verhoeven have made film fans hungry to see the original, uncut, unrated, even bloodier version of Robocop over the years, and it just got way easier—Amazon Prime is streaming it! But here’s the odd thing: They haven’t labeled it as the “unrated,” “NC-17” or “X-rated” cut of Robocop, despite the fact that it clearly is. Are they aware of the fact that this version is rare? Is this just a happy coincidence? 1. During the boardroom meeting, ED-209 begins to shoot Kinney who falls back on a table. Additional shots are then shown of him being shot at continuously in rapid succession. There is also an additional, quick shot of ED-209’s programmer unsuccessfully trying to shut it down by ripping out its power cord. 2. Murphy’s death scene is the most altered scene in the movie. Additional shots include when his hand is shot off, Murphy gets up and a visible stump is seen where his hand used to be. An additional shot shows his right arm being shot off completely and him screaming in pain. In the theatrical version, this scene is missing and Murphy is merely shown with one arm without any explanation. The final seconds of his murder shows an additional shot of the camera spinning around Murphy as he withers in pain and Clarence shoots him in the head and a hole appears. This original shot was achieved using a sophisticated animatronic puppet of Peter Weller controlled off-screen. One final overhead shot also shows the bloody aftermath of what has happened to Murphy as Lewis looks on shocked at his dead body. 3. Bob Morton’s death now shows a close up of additional bullet holes puncturing his leg before he falls down. 4. When Clarence Boddiker is stabbed in the neck, there is an additional shot of him holding his neck as he turns around and blood spurts from the wound like a fountain. Having checked out the scenes for ourselves, we can report that they are harrowing indeed—especially the death of Murphy, which is much more gory and drawn out. In interviews, Verhoeven has explained that the original cut of Robocop was meant to be more obviously satirical of film violence by turning everything up to 11, which makes scenes like Kinney’s death more inherently comical. Ironically, Verhoeven says the cuts forced by the MPAA actually made these scenes more serious and heavy by robbing them of their humor. Few film fans have ever seen the original versions, though, as the uncut version of Robocop has only been included on a few physical releases, including the 2014 Blu-ray 4K master edition. Don’t take our word for it, though. If you want to see the bloodiest version of Robocop that has ever existed, you can watch it now via Amazon.